The Jamun Fruit, also known as the Java Plum, is a nutritious exotic fruit with high-levels of antioxidants. The Jamun Tree is commonly found in several parts of SouthEast Asia like Myanmar, Indonesia, and the Philippines. The Jamun Fruit is oblong in shape and green in color that turns into dark purple or crimson black when ripe. It tastes sweet with a little bit of sour and stains a purple dye-like color in your mouth when eaten. The Jamun fruit is rich in vitamins such as Thiamin, Riboflavin, Niacin and vitamin C. It is best known for its effect on faster wound healing as it helps prevent further cell damages. Regular intake of the Jamun fruit also lowers your risk of developing cancer. 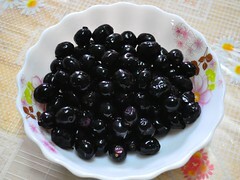 Moreover, the Jamun fruit is also rich in minerals such as calcium, magnesium, iron, phosphorus, potassium and sodium. Thus, it helps prevent dehydration. The Jamun fruit is considered to be a healthy snack for someone who is busy at work as it boosts your immune system giving you more energy and body protection. It prevents further infection because of its anti-bacterial effect. So if you’re looking for an exotic nutritious organic fruit snack, then the Jamun fruit can give you an exotic way of being healthy.